While paddling a rented canoe one day the paddle struck a rock and snapped in two a little below the center of the handle. The boatman laughed at the idea of trying to fix it, but after paying his price for the paddle I decided to try mending it. 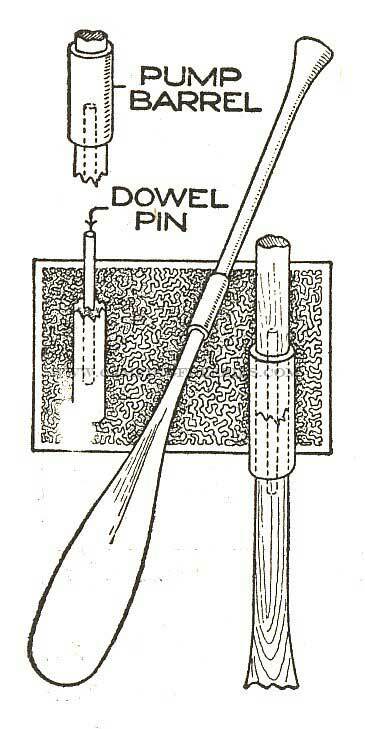 The barrel of an old bicycle pump was procured and I found that it fitted over the paddle at the break a trifle loosely. It was pushed on the handle out of the way. Then with a No. 8 bit I bored a hole 8 in. deep in the end of each broken part. Into these holes, which formed one cavity when the broken ends were brought together, was forced and glued a tight-fitting 16 in. 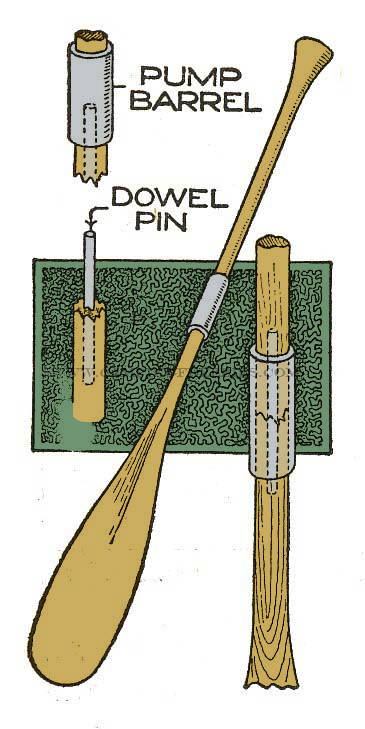 dowel pin. The outside of the handle was then wrapped with tape for about 10 in. each side of the break, and the pump barrel was forced down over this tape until it completely and firmly enveloped the broken ends.